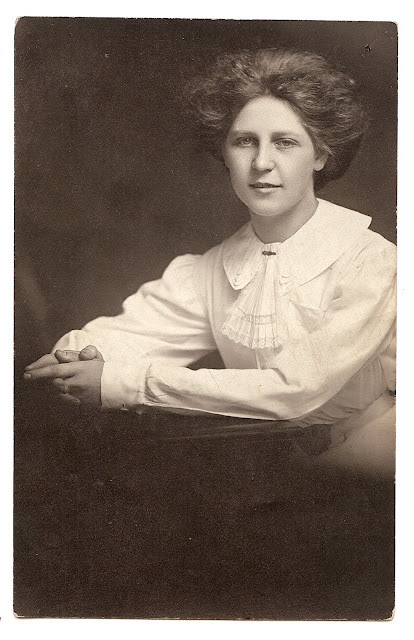 It is an early 1900s real photo postcard (RPPC) of a lovely young woman, dressed in classic Edwardian style. She has on a beautiful white blouse, tucked in tightly at the waist, with slightly poofy sleeves, a wide, flat collar, and an inverted fan of lace between the edges of the collar. The look is pulled together by a fashionable metal bar pin at the neck. And don't you just love her hairdo? Although pulled carefully up and back , it also has a sort of loose and untamed look to it. The photo itself is just stunning. No matter how many thousands of vintage photographs we see, we never cease to be amazed by the sharpness and clarity of photographs that date back more than one-hundred years! I love old photographs from this era. Amazing clothes and such a different take on what determines feminine beauty. She has a Mona Lisa quality to her expression. I like it! Oh I like the Mona Lisa comment, Glitter!